Once again, Collins has come through with a thouroughly entertaining book. 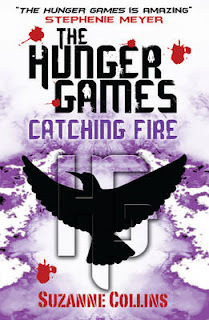 I read the first book in The Hunger Games trilogy on Christmas Eve Eve and couldn't put it down, it was just so addictive. You can read my review of the first book by clicking here. If you haven't read the first one and you think you might, then you probably don't want to read this review yet. This book started off a lot slower than the first. Katniss has returned to District 12 a Victor, but things aren't quite as good as they seem. Katniss survivng the Games has been seen as an act of rebellion and defiance, not only by the Capitol, but also by people in the other repressed Districts. Katniss tries to go back to a normal life, as normal as life can be when you've gone from abject poverty into a house with more food and water than they could ever need. But it's not going to happen. Things are not going to go back to normal for Katniss as hard as she may try. The Capitol makes it clear to her that she must do what she can to show that she is loyal to the Capitol, in order to quell the fervour of those who want to rebel. It doesn't go to plan, and suddenly Katniss' world is thrown upside down once again. When this happens the pace really picks up. The first third of the book slowly builds to create lots of tension. Collins does a good job of making you feel Katniss' despair at her situation. By the second third, you're hit in the face by the decisions made by the Capitol, and the tension then continues to build into the final third and on the very last page. This book finishes with a cliff-hanger, unlike the first one, which had a 'kind-of' ending, still leaving me wanting more, mind you, but this one is very open-ended, anything could happen, and I can't wait for the third and final book to come out later this year (I hope). As I said with the last one, I highly reccommend this book and I'm giving it a Big Thumbs Up. I keep meaning to buy the first book, based on your review, but haven't got around to it yet. Now I know there's three of them I'll have to get onto it!